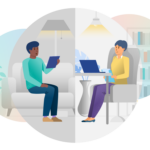 Telepsychiatry sessions can occur on a variety of devices including desktops, tablets and standards based endpoints so organizations can choose the hardware that works best for them. Best practice is to use a device with at least a nine-inch screen to conduct quality telepsychiatry sessions. Most organizations with telepsychiatry programs use a computer with a camera or a dedicated videoconferencing unit that is hardwired in a designated telemedicine office or small conference room. These systems typically include a camera mounted atop a monitor that may be remotely controlled by the telepsychiatry provider. While a staff member onsite will need to activate the equipment and facilitate an introduction between the consumer and the remote provider, it is normally not necessary for that staff member to remain in the room during a routine encounter. Most hospitals use a mobile televideo equipment setup that can be mounted to an IV pole or rolling cart so that the video unit and the telepsychiatry provider will effectively be brought to the patient within the emergency room or stall. Depending on the technical capabilities and infrastructure of the hospital, these systems may be set up to operate wirelessly or be configured to be physically plugged in prior to the encounter. Televideo units should be compatible with standards-based video conferencing networks and generally rely on H.323 or SIP protocols. Is it interoperable with other televideo systems and software? Does it include other tools like billing and documentation or will you need to use separate systems for each? For optimal results, a reliable, high speed internet connection with a bandwidth of at least 8mbps will minimize connection failures and provide a high quality televideo session. Firewalls or port limitations may be restricting certain types of outgoing or incoming traffic. If you have questions about your speed, connection strength or firewalls, contact your internet service provider. The best connectivity for televideo sessions is a hardwired connection between the computer and the cable modem from your internet service provider. For best results, connect a laptop or desktop by Ethernet cable for internet connection. Using a hardwired connection will reduce the risk of information loss and connectivity issues.